Public support for the concept combined with adoption from the Democrats has sparked renewed optimism. WASHINGTON — Somebody tell John Oliver — the battle over net neutrality is back on. Democrats are expected to use their upcoming control of the House to push for strong net neutrality rules — put in place by the Federal Communications Commission under President Barack Obama but pulled back by President Donald Trump’s FCC — highlighting how the once-wonky concept has become a national issue. While net neutrality advocates are expecting a setback in the near term (a Senate effort to undo the FCC’s decision is expected to fail), public support for the concept combined with adoption from the Democrats has sparked renewed optimism. Net neutrality refers to the concept that internet networks (and the companies that run them) should not block or manipulate web traffic. While most internet providers have agreed to abide by rules against blocking legitimate websites, net neutrality advocates have argued that major internet providers could prioritize internet traffic for profit, effectively scuttling the open nature of the internet and turning it into a system closer to cable TV. Net neutrality rules have been the subject of a decade-long push and pull that began in 2008, when the FCC punished Comcast for interfering with uploads to file-sharing service BitTorrent. Since then, the FCC’s rules and role in enforcing net neutrality have been the subject of a series of commission votes and court rulings. Comcast is the owner of NBCUniversal, the parent company of NBC News. 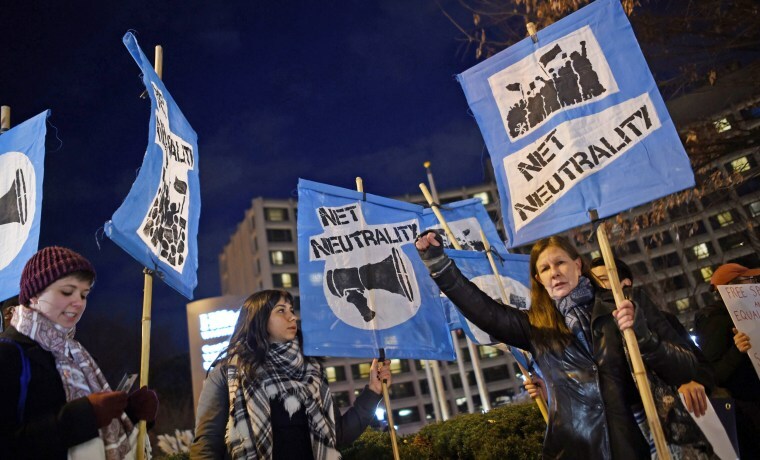 Net neutrality as a political flashpoint, however, is a relatively new phenomenon. The topic became entered the national consciousness in large part due to John Oliver, who tackled the topic on his HBO show with a humorous segment on the topic and then-FCC Chairman Tom Wheeler, who helped push for the net neutrality rules and later received an apology from Oliver. Despite Oliver’s segment, it was something of a surprise when Obama endorsed strong net neutrality rules in 2014. Now, most Democrats have now come out strongly in favor of the rules. Democrats will officially take control of the House on Jan. 3, and speculation about who the party will run against Trump in 2020 has already begun in full. Gigi Sohn, a former lawyer at the FCC who is now a fellow at the Georgetown Law Institute for Technology, Law and Policy, said she expects Democrats to use their new power to push for the restoration of strong net neutrality rules — and for the topic to be on the lips of presidential hopefuls. Jessica Rosenworcel, an FCC commissioner who has been a vocal supporter of net neutrality, noted that it has become a national issue — and one that has broad approval from Americans. She pointed to a University of Maryland study that found 83 percent of people surveyed were against the FCC’s move to undo the rules around net neutrality. On the state level, governors are already taking executive actions to protect net neutrality, and through bipartisan efforts, lawmakers in 30 states have introduced legislation to put in place net neutrality protections and standards. Ernesto Falcon, legislative counsel at the Electronic Frontier Foundation, helped organize a grassroots campaign around the passing of California’s S.B. 822, one of the earliest laws to establish rules around net neutrality on the state level. Falcon said he is “extraordinarily confident” that proponents of net neutrality will win. “It really just boils down to how one side of the polling is in this space,” Falcon said. Though California’s bill, deemed a “gold standard,” will remain stagnant until pending litigation around last year’s FCC rollback of the federal rules is resolved, it represents opportunities advocates are pursuing to preserve net neutrality across all branches of government. The consolidated appeals against the FCC’s deregulation of Internet providers will be decided in D.C.’s Circuit Court. Oral arguments are set to begin on Feb. 1, 2019.